Movie baby Skipper VS. Cartoon baby Skipper. What do you guys think about the comparison?. HD Wallpaper and background images in the Os Pinguins de Madagascar club tagged: photo skipper baby chick cartoon movie film trailer. I find the show Skipper to be more adorable and attractive than the movie Skipper. @FanOfStuff97: LOL, that's what I've been saying! That's mainly why I like the show version better. Ignoring that fact, I can't choose my favorite, they're just so cute! @FanOfStuff97: I SO have to agree. @PB7: I think what they were trying to do was create a unique shape for all of them to differ from each other. Like how they are fully-grown. If they were all round-shaped, it would ruin that. So I guess it's not all bad..
@FanOfStuff97: Yeah, I didn't mind that at all. They're still adorable. I just wish they would've had down feathers like Private since they are babies, and that their voices were the same as when they're adults. Although, I'm gonna try to let that not bother me, since they're still adorable as all get out, and I'm thinking the movie will be SO awesome. @PB7: They are super adorable. I agree. I can't wait for some more clips to be released! @FanOfStuff97: Me neither! I'd LOVE to see this first scene with their backstory! Omg their both so adorable, I can't handle this!!!!!! But honestly, Skipper in the show is a little cuter in my opinion, with his feathers and eyes shape but the movie version is adorable too!!! @PB7: OMG, I can't wait to see it! We've been waiting for forever for this scene! This will clear up a lot of ideas and theories on their pasts. @Number1SkippFan: We're all going to start saying "flipping" aren't we? i don't like the baby skipper in the movie. plus, he has adult Skipper's voice. not anatomically correct. Both are adorable, but I DEFINITELY think the show baby Skipper is cuter... or at least a little cuter. 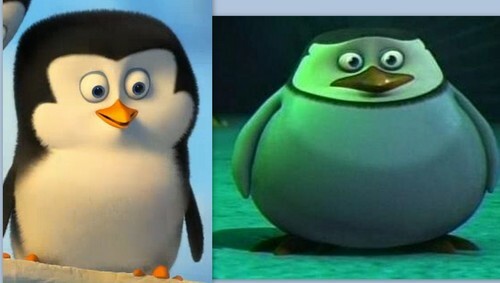 The baby penguins in the movie seem to have plumage more true to their species. To me, Skipper looked too much like an emperor chick in "Rock-a-By Birdie." The penguins do not look completely like any real species, but they're not emperors. I think Skipper, Kowalski, and Rico don't have down feathers in the movie because the animators wanted to show that they were at least several months (or more) older than Private. @TheRatKing1: I probably would have used different voices for the chicks too. @SJF: About the down feathers, that's a good point. I hadn't thought of that.